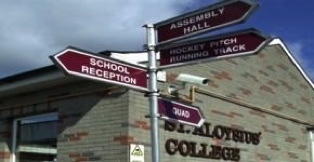 As well as the general classrooms, facilities include the following specialist rooms - Art Rooms, Assembly Hall, Auditorium, Glenmary Sports Hall, Home Economics Rooms, Language Laboratory, Music Rooms, Science Laboratories, Sewing Room, Modern Computer Rooms and a general social area known as the Quad. External facilities include a full size all weather Hockey Pitch, Running Track, Tennis Courts and a green area for field events e.g. shot put, long jump. Pupils also use the local GAA pitch and local girls primary school playing field for Gaelic Football and Camogie. Equestrian teams participate in National Competitions. Library: There is a wide selection of books, DVDs, CDs and Videos available to enhance the teaching and learning of the curriculum. School Trips: School Tours and Field Trips are organised in Ireland and abroad. Supervised Study: Currently available to Junior Certificate and Senior Cycle Students. Sports including: Athletics, Badminton, Basketball, Camogie, Equestrian, Gaelic Football, Hockey and Tennis. Extra Curricular Activities: Choral Festivals, Debating in Irish/English, Orchestra, Quiz Teams and School Show are an integral part of school life. Pastoral Care: THe liturgical life of the Church is celebrated. A part-time chaplain is employed. Education for justice and peace is kept constantly in mind. Guest speakers visit the classes and speak on social justice issues. Charitable events are organised throughout the year. We are highly committed to regular fund raising for our sister school in Kitui, Kenya. Students are assisted on an individual basis with all aspects of vocational / career choices. A percentage of our students go on for further education at third level. Career department gives advice about choices for CAO - strengths and weaknesses, interests and wishes- personal portfolio. The process commences in Transition Year. Pupils are able to make an informed choice about the career path to take. Our library provides up to date information & materials regarding qualification requirements. Pupils attend Open Day & Careers Exhibitions which provide excellent guidance in preparing pupils for the next stage of education whether in the work place or in third level. In the future it is hoped to develop an electronic library and to install computer terminals so that Leaving Certificate pupils will be in a position to download their CAO applications directly. Our counsellor is available to help students with a wide variety of problems - educational, social, emotional. Students and parents/guardians are encouraged to adopt an ask for help" attitude.